9-1/2" high. Each outguide includes one transparent diagonal-cut pocket and an additional 3 x 5 index card pocket. 12-5/8" wide. Clearly mark where folders have been removed. Small pocket holds charge-out form (sold separately). Large pocket holds documents to be filed. Center position tab printed "OUT." Colorful poly. Acid-free, PVC-free and archival-quality. 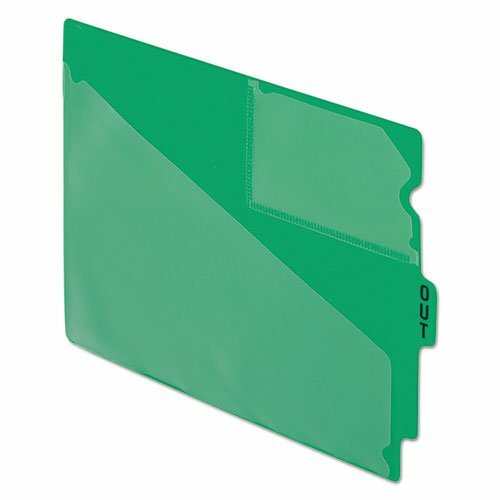 Blank/Pre-Printed: Out; File Guides Type: Preprinted End Tab Out Guides with Pockets; For Card/Sheet Size: Letter; Guide Size: Extra-Wide Letter. Boldly mark where folders have been removed with these bright red guides. Large pocket temporarily holds full sized documents to be filed in the folder when its returned. Small pocket can hold a charge-out guide. Pack of 25 Black Letter Size Center End Tab Outguides. Place a charge out slip into the slant cut pocket to track the location of the removed file. The large pocket is used to hold documents and information that accumulates while the file is out. "OUT" is debossed into the tab. Available in a variety of colors for color coding. Pack of 25 Purple Letter Size Center End Tab Outguides. Place a charge out slip into the slant cut pocket to track the location of the removed file. The large pocket is used to hold documents and information that accumulates while the file is out. "OUT" is debossed into the tab. Available in a variety of colors for color coding. Stay Organized And Know Where Your Files Are. Preprinted "out" Center End Tabs Make It Very Easy To See Which Files Are Out. Each Outguide Has One Transparent Diagonal-cut Pocket And A 3 X 5 Index Card Pocket. 12 5/8 X 9 1/2. Manufacturer's Lifetime Guarantee. 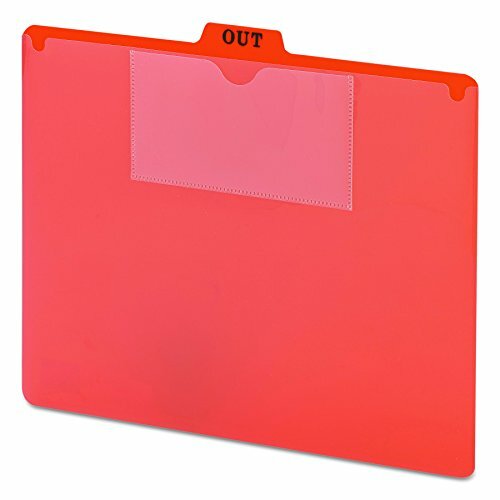 Blank/pre-printed: Out; File Guides Type: End Tab Outguides With Pockets; For Card/sheet Size: Letter. 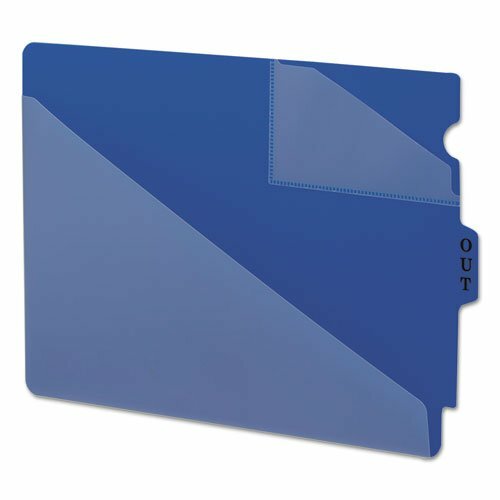 Pack of 25 Blue Letter Size Center End Tab Outguides. Place a charge out slip into the slant cut pocket to track the location of the removed file. The large pocket is used to hold documents and information that accumulates while the file is out. "OUT" is debossed into the tab. Available in a variety of colors for color coding. Pack of 25 Clear Letter Size Center End Tab Outguides. Place a charge out slip into the slant cut pocket to track the location of the removed file. The large pocket is used to hold documents and information that accumulates while the file is out. "OUT" is debossed into the tab. Available in a variety of colors for color coding. Pack of 25 Orange Letter Size Center End Tab Outguides. Place a charge out slip into the slant cut pocket to track the location of the removed file. The large pocket is used to hold documents and information that accumulates while the file is out. "OUT" is debossed into the tab. Available in a variety of colors for color coding. 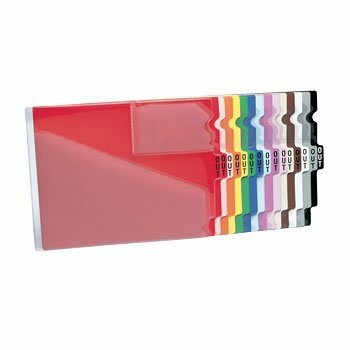 Pack of 25 Pink Letter Size Center End Tab Outguides. Place a charge out slip into the slant cut pocket to track the location of the removed file. 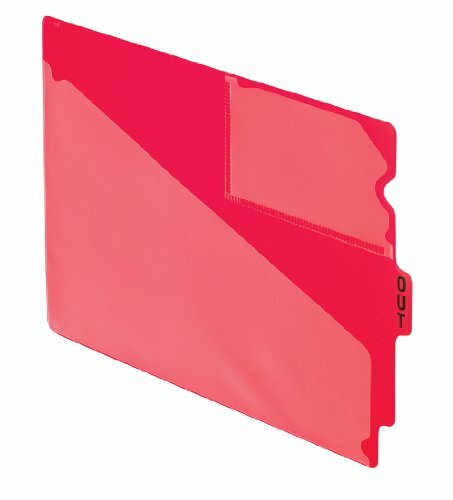 The large pocket is used to hold documents and information that accumulates while the file is out. "OUT" is debossed into the tab. Available in a variety of colors for color coding.